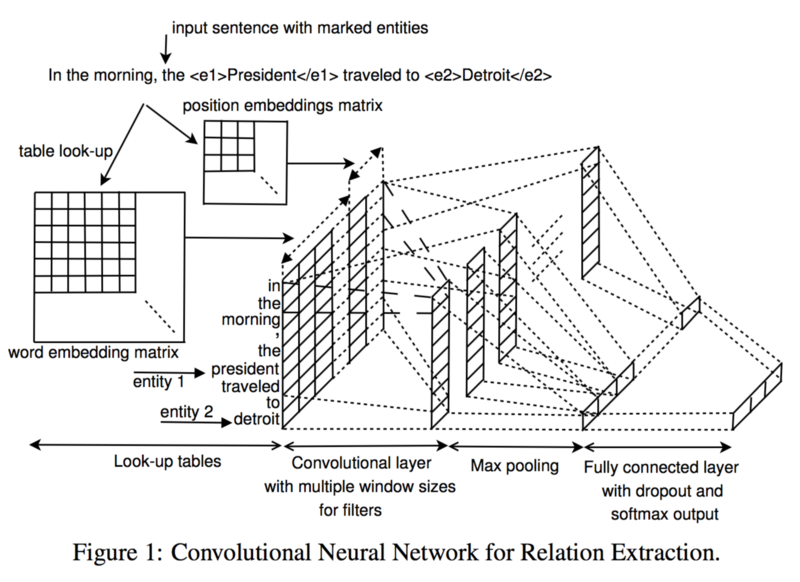 Tensorflow Implementation of Deep Learning Approach for Relation Extraction Challenge(SemEval-2010 Task #8: Multi-Way Classification of Semantic Relations Between Pairs of Nominals) via Convolutional Neural Networks. Train data is located in "SemEval2010_task8_all_data/SemEval2010_task8_training/TRAIN_FILE.TXT". "GoogleNews-vectors-negative300" is used as pre-trained word2vec model. Performance (accuracy and f1-socre) outputs during training are NOT OFFICIAL SCORE of SemEval 2010 Task 8. To compute the official performance, you should proceed the follow Evaluation step with checkpoints obtained by training. 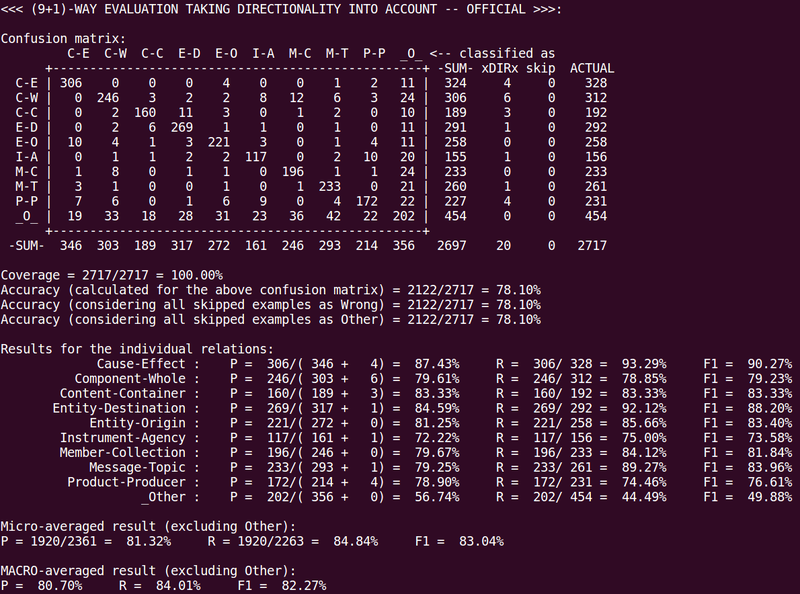 $ python train.py --embedding_path "GoogleNews-vectors-negative300.bin"
You can get an OFFICIAL SCORE of SemEval 2010 Task 8 for test data by following this step. README describes how to evaluate the official score. Test data is located in "SemEval2010_task8_all_data/SemEval2010_task8_testing_keys/TEST_FILE_FULL.TXT". MUST GIVE --checkpoint_dir ARGUMENT, checkpoint directory from training run, like below example. $ python eval.py --checkpoint_dir "runs/1523902663/checkpoints/"
Goal: recognize the semantic relation between these nominals. "There were apples, pears and oranges in the bowl." OTHER: If none of the above nine relations appears to be suitable.